While I was in Copenhagen, I told myself that I must stuff my face with lots of Danish pastries. I love Danish pastries, and I also had my fair share of disappointment. Especially in Singapore, no one does really good Danish pastries – they are usually commercially made and they don’t taste very nice. I braved the morning rain and after walking in circles for almost half an hour, I finally managed to locate Conditori La Glace – the oldest confectionary in Denmark. Opened its door in 1870, Conditori La Glace has been serving delicious cakes and pastries. This historical café is beautiful, laced with history. I got there really early (I was their second customer) hence there was a limited pastries and cakes on display. And unfortunate for me, the staff at the counter did not really speak English so I did the “look what’s nice, point and order”. While I was waiting for my pastries and tea to be served to me, I stared at the walls of Conditiori La Glace. It was decorated with family pictures from different generations. Every picture is telling a story about this café. At the same time, I started to notice all the cakes are rolling out to the display counter. I could only wish for a bigger stomach to have a taste of all the cakes. When my pastries were at the table, I noticed I ordered two similar looking bakes. Still I was excited to sink my teeth in them. Though the pastries were not warm up, the moment I bit into them, the puff pastry just shattered. I love the custard centre which was creamy and not too sweet. And to my surprise, I don’t mind the marzipan icing. I personally detest almond-based product but the icing was pretty good and it complimented the puff pastry. I enjoyed my breakfast at Conditiori La Glace so much that I returned a couple days later for afternoon tea. Despite the rain, there was a long queue and it was impossible to go in. This left me quite sad, as Conditiori La Glace really made the best Danish pastries I ever tasted. After a few days in Norway and Evie back to work, I travelled to Copenhagen, Denmark. The reason why I chose to go to Denmark was because later the week, Evie and I would be going to Legoland. So yes it was about convenience. Once I landed in Copenhagen, it was quick a train ride to my hotel. I have chosen to stay in WakeUp Copenhagen as it was apparently a 15-minute walk from Copenhagen Central Station. All I can tell you is whoever timed the walk did not have to pull a large suitcase. As I arrived really early, I couldn’t check-in. I was told that if I upgrade my room, I could get an immediate check-in. I was tired and cold so I forked out the extra dough for a two-hour nap. When I awake, it was nearly noon. My first stop was the Ny Carlsberg Glyptotetek museum. Before I view the exhibits, I needed to fill my stomach. Located in the Winter Garden, the museum’s café served up hearty Danish fare. When I arrived at 1.30pm, the café was almost fully packed. After studying the menu, I chose a dish which comprised of two types of herring, boiled egg, onion and capers (DKK98/ S$21). This was accompanied by traditional Danish dark rye bread. I never had herring before so I didn’t have much expectations and I was unsure if I would even like the dish. In the end, I love it. The herring was pickled hence it was not fishy yet the structure of the fish remained and did not disintegrate. When I saw the rye bread (which was another first for me), it looked cardboard dry. But it was not. With a smear of butter, the bread was chewy and flavourful. I topped the bread with a bit of herring, onion, capers and egg, it was absolutely delicious. I never thought I would like pickled fish that much. The plate did not look like a lot, but I was stuffed. A great start to my Copenhagen trip. After lunch, I wasted no time and started going around the museum. Established in 1888, Ny Carlsberg Glyptotetek museum is an art museum founded by brewer Carl Jacobsen (his father is responsible for Carlsberg beer). The museum houses a wide collection of Egyptian, Greek, Etruscan and Roman arts. They are also noted for French impressionists and Danish Golden Age paintings. If you are a fan of the arts, Ny Carlsberg Glyptotetek museum is worth checking out. Once I am done with my little art trip, I did a random walking tour around the city. As I strolled, the rain started, and it was quite difficult and slippery to walk on cobblestone, I seek refuge at a chained Danish pastry shop – Lagkagehuset (which also happened to be on my eating list). At Lagkagehuset, you will be swarmed by the choices. There are so many delicious looking pastries. To order, you will first need to get a queue number from the machine. The server will call out your number and you will then tell him or her what you want. After changing my mind several times, I settled for a strawberry tart. The tart was made up of a chocolate shortcrust pastry, filled with pastry cream and topped with fresh strawberry and almond. When you are wet, unprepared for the gloomy wet weather, this strawberry tart cheered me up (and my cup of hot latte too). That said, the long wet walk back to the hotel was horrible. I need more tarts. During my trip to Perth last May (yes, time flies), on one of the nights I needed to stay in and finish some work. My buddies from university saved me from hunger and brought me dinner from Jus Burgers. I had a classic cheeseburger (with blue cheese) (A$12.50) which was juicy and delicious. 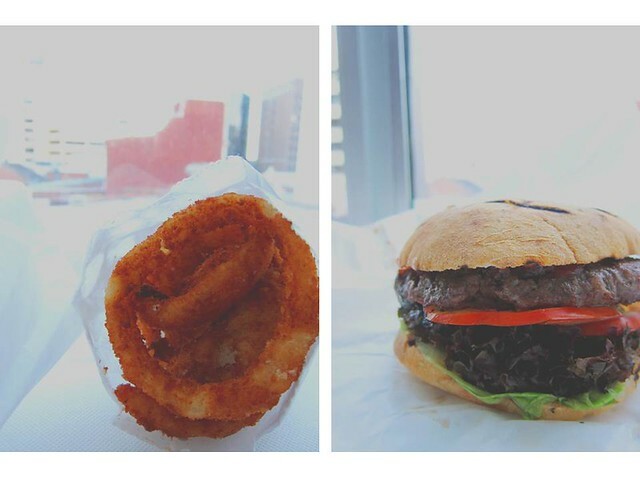 But what blew me away was their onion rings (A$6.00). 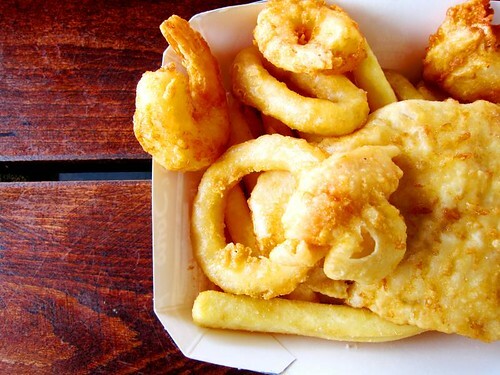 They were the good onion rings – they were crisp, sweet and heavily salted. If I stayed in Perth, these would be my go-to snacks (thank god I don’t stay in Australia). Since opening its door last February, I am unsure how many times I have been to Balzac Brasserie. Located at the newly renovated Rendezvous Grand Hotel, this quaint bistro has been serving out delicious comforting French classics at a very reasonable price. Each meal at Balzac will start with a bread basket. At every visit, a different variety of bread is offered to me and most importantly, they are always piping warm. Each basket is usually accompanied by herbed butter and salmon rillettes (the latter was changed when I was there recently). I had to show some restraint and not fill my stomach with bread. One of the must-have for me is their Dubois’ lobster bisque (S$16). This rich broth is served with a small bowl of mini black Qwehli prawns which are salty and provide crunch when eat together with the soup. I would usually share the soup with a friend – I know that if I have this alone, I won’t have any space for my main (yes, it is that rich). Every time I am at Balzac, I would attempt to order a different main. I have tried Entrecot (steak frites), roasted French quail, seabream en papillote – among these, my favourite remains the beef cheeks a la cuillere (S$26). 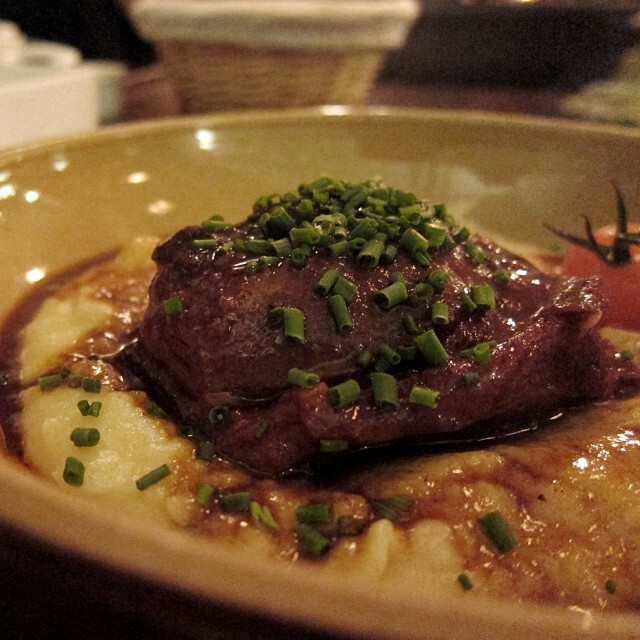 The waygu beef cheek is braised for 48 hours and served with a smooth buttery mashed potato. This dish is a delight – the braised cheek is tender and melt in your mouth. A friend who had a funny expression when she heard beef cheek was turned and love this dish. The desserts at Balzac could be their weakest link. They are not terrible – they are actually pretty decent. However when you compare to their starters and mains, they don’t blow your socks off. To leave my meal with a sweet note, I will opt for the riz au lait (rice pudding) (S$9) and Valrohna chocolate moelleux (S$12). When I first visited Balzac, the service was rather shaky. My friends and I had a hard time getting the attention of the waiter, the food is served before our drinks. Over time, the service has definitely improved tremendously. During my recent trip, there was a miscommunications and my friend’s order was not registered. Our server, Wenna, was bent on finding out what happened and even sent over a tarte au citron to apologise. 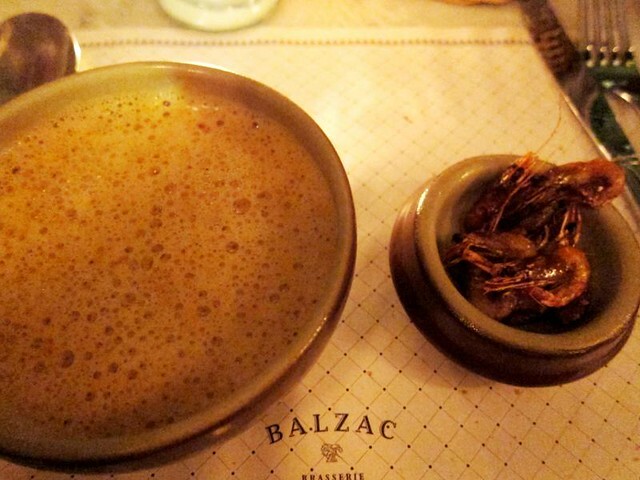 If you are looking for a delicious rustic French fare, give Balzac a try. Oh and remember to order the lobster bisque. If there is one meal that I have to choose to eat for the rest of my life, it will be Teochew muay (rice porridge). I grow up eating Teochew muay, I love it and never got sick of it. And till this day, I still think my grandmother makes the best Teochew muay. Unlike the Cantonese congee where the rice grains break down to almost liquid form, the Teochew version retains the shape of the rice and pending on personal preference, you can have a watery porridge or a pretty dry porridge (in case you wonder, I love the watery version). 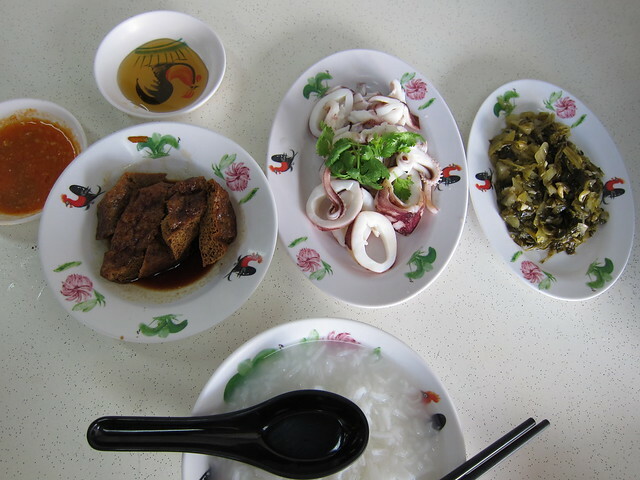 In addition, the accompanying dishes for Teochew muay must be salty, to complement the bland yet sweet rice porridge. Some of the dishes that my grandmother always cooked (and I loved) to go with the porridge are bittergourd with eggs, preserved radish omelette, stir-fry pig livers with spring onion (yes there was a time I ate pig livers), and braised mustard green with tau pok (dried and fried beancurd). It is pretty rare for me to eat Teochew muay outside. I only do so if I am sick or have a craving, and all seem to pale in comparison with my grandmother’s version. Recently I was recommended to try Soon Soon Teochew Porridge that is a stone throw away from my house. My friend Lynda said I must have the steamed sotong (squid). And so I went. At Soon Soon, you will be confronted with a lot of Teochew dishes – braised pork belly, minced pork ball, homemade fish cake, bittergourd and many more. I chose my personal favourite – preserved mustard green, braised tau pok and of course the steamed sotong. The rice porridge is pretty good – the rice grain has broken down just enough. 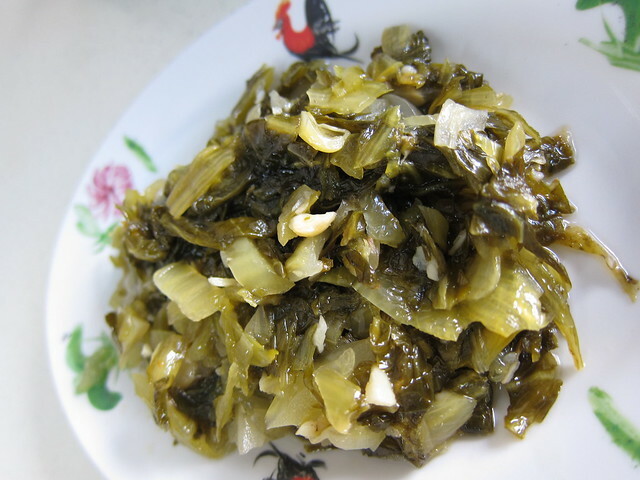 The preserved mustard green and braised tau pok were not too salty. But for me, the star is the steamed sotong. When I first saw this dish, I thought it look rather plain. I am not sure what magic powder Soon Soon used, the steamed sotong was not plain at all. I am guessing the sotong was lightly seasoned and steamed with precision. 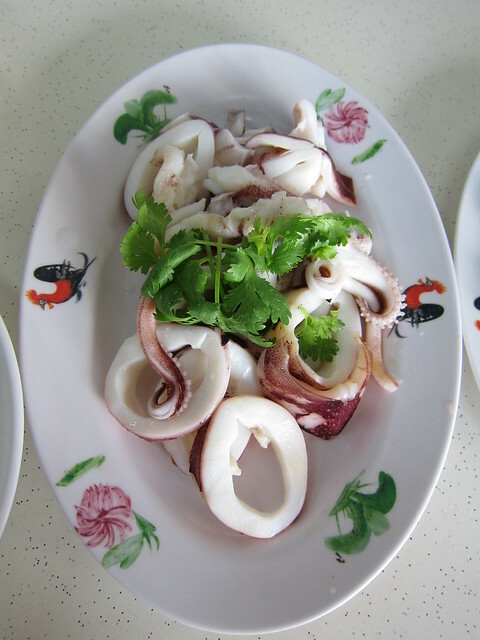 The sotong itself was tender (not chewy) and it was sweet and delicious. I was going “I need a bigger piece”. The unfortunate news is that the steamed sotong is not available all the time. And the staff is unable to tell me when it is available. So if you ever drop by Soon Soon and see the steamed sotong, please order it. It is slightly pricey but it is worth it. Good luck. Recently I helped my friend Su with the collection of her runner’s pack, in return she bought me dinner. She told me the place she was bringing me is owned by a good friend of hers and it was not a fancy place but they served delicious Indonesian food. With that, I was sold. A couple of years ago, I worked with a group of young, energetic Indonesians. They often get homesick. To curb this problem, they seek solace in food that reminded home – ayam penyet, bee hoon bakso and so on. These colleagues of mine slowly introduced me to the fascinating world of Indonesia’s cuisine. And I became obsess. Bakmie Jakarta (by Jiak Bak Mee) is run by Indonesian Marcelly Suhali (and her husband is her faithful sidekick). 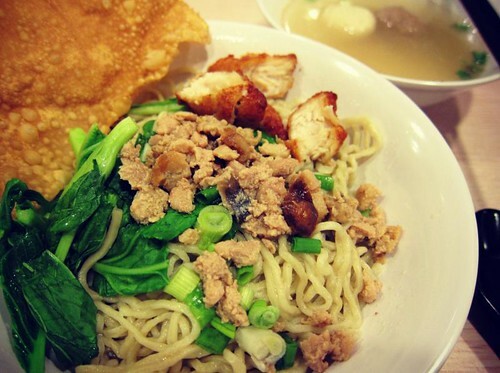 From Marcelly, I learnt that bakmie is a simple, fast food favoured by the Indonesian-Chinese. Bakmie, similar to our bak chor mee, comprised of mee and minced chicken (with bits of mushroom). You can add kecap manis (sweet sauce) and sambal asli (chilli sauce) onto the noodles. At Bakmie Jakarta, they offered a few type of noodles and different combination. For a first-timer, Su recommended me to have the Bakmie Special Set (S$6.90) which is bakmie with minced chicken, chicken katsu and pangsit goreng (fried wanton). I was really excited to try bakmie – pork-free bak chor mee (yay). Upon ordering, we got our noodles in five minutes. 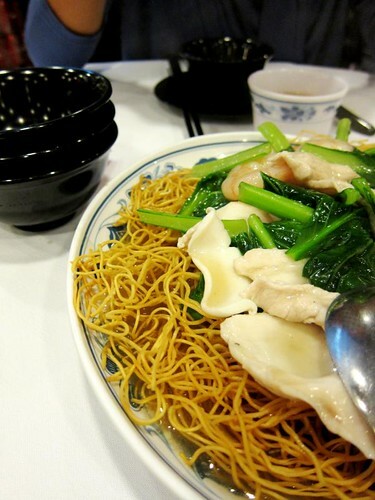 I had a quick bite of the noodles – I love the chewy texture. Most importantly it does not have the alkaline taste which you will get from yellow noodles. With a good drizzle of kecap manis and sambal alis, it was perfection. Marcelly told me that the noodles are based on her mother’s recipe – eggs are added to give the noodles colour and texture. Marcelly’s mother even weighed the noodles so that the customers will have a consistent experience. The special set was definitely a great way to figure out what you like (or don’t like) or when you want everything. For me, I don’t fancy the chicken katsu. As they used breast meat, I find the chicken to be overcooked and dry. I also appreciate that each set comes with a bowl of soup. Since I ordered the “greedy set”, my soup has a bakso sapi (beef ball), fishball and wanton. I be honest here, I was prepared for the soup to be larded with MSG. I was happy that I was proven wrong. The soup tasted like itek tim (salted vegetable with duck soup). It was a bowl of good soup – I had to stop myself asking for a second bowl. As Su and I have the privilege to eat with the owners, we were treated to a new side dish they were introducing – tahu gerjot (S$2.50). It was essentially fried tau pok with a sweet, sour and spicy dressing. We were told that tahu gerjot was often served as an appetizer as the tangy dressing waken the appetite. It not just woke up my appetite, I was addicted to it. It was moreish and it was pretty hard to stop. At Bakmie Jarkarta, you know you are getting authentic Indonesian cuisine as most of the regulars are Indonesians. Some of them even ate there on a daily basis. It is true Bakmie Jakarta is not the fanciest joint in town. But they sure can bring a bit of home to you. My second day in Norway was sort of ruined by the Oslo Marathon. Unlike the marathons in Singapore which usually end around 11am, Oslo Marathon stretched from 6am to 6pm. Because of the long hours, many museums were closed. And the “hop on hop off” bus which we planned to take was cancelled. Evie and I spent the day roaming around Akershus Fortress (but the castle and guided tour were not available) and the city. We returned to the city the next day and we were thrilled to take the “hop on hop off” bus (150NOK/ S$32/ US$26)*. It may be touristy but it is one of the best ways to see Oslo. Furthermore this bus does not operate all year round. I was lucky as it was the last week of operation and they will be closed for winter. Cooking pot made from wood! The first place that we hopped off was the Viking Ship Museum (60NOK/S$13/US$10). At the museum, ships from Gokstad, Oseberg and Tune were on display. Besides the majestic (and fragile looking) ships, items like tools, kitchenware, were also showcased. The museum is not big so you can finish touring pretty fast. Still I was in awe by the grandness of the ships and the history that encompassed. After our quick tour around the Viking Ship Museum, Evie and I got really hungry. We stepped out of the museum to see if there is any nearby cafés. We spotted a signage that said there was a café around the corner. After a 5 minute walk, we found Café Hemma Hos. Decorated in Victorian-styled furnishing, Café Hemma Hos has a small but interesting menu. Both Evie and I have our eyes on the salmon cake (How can I go Norway, and not eat everything salmon?) and we ordered one each. The salmon cake (189NOK/ S$40) was served with quinoa, roasted vegetable, garlic aioli and two slices of toast. When we looked at our plates, Evie and I wondered if it is enough to fill our tummies (we ain’t small eaters). And it did. And we were stuffed. The salmon cake was stodgy and packed with salmon – they were definitely not stingy with the fish. The cake itself was not fishy. The taste and texture reminded me of our otah minus the spice. I also love the accompanying quinoa and roasted vegetables which had beautiful chargrilled look and taste. Before our meal was served to us, the waitress made a mistake with our orders – she gave us chicken sandwiches instead. Hence we waited much longer for our food. Once the owner of café arrived, our waitress immediately fessed up her mistake to the boss. The owner came and apologised and offered us more tea and cake. I was really impressed with the service. Café Hemma Hos is not just your ordinary cafe, it is also a furniture shop. While we were having our tea, someone eyed the chair that I was seating. So if you fancy the dining table, the plates you are eating from, you can actually bring them home. 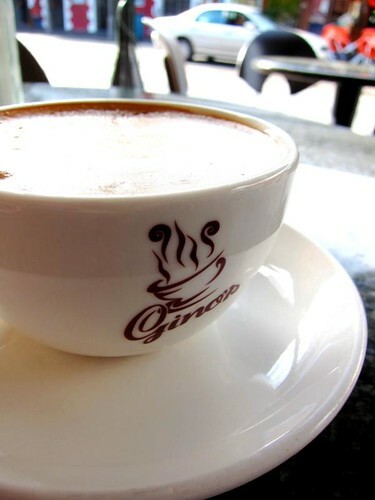 As much as we would love to stay in the café and have more tea, we have a tight schedule and more museums to visit. *The tour is about 75 minutes. You can pay via credit card. If you are paying cash, it is better to pay in Norwegian Krone than Euros. Entrance is free. But you will need to pay for guided tour and entrance to castle and museum. Please check website for opening hours. Yes it is that time of the year where I indulge in an entire month of feasting, choosing the venue and not paying a single bill. For this year, some of the places were misses – there were still some great winners! One of them is an old favourite of mine – Por Kee Eating House 1996. Despite the heavy rain, and arriving an hour after it open, Por Kee was packed on a Sunday evening. I am thankful my friend (and also the one who paid the bill) Kristen made a reservation and we got to sit comfortably in the air-conditioned section of the restaurant. As there were three of us, we didn’t want to over-order. 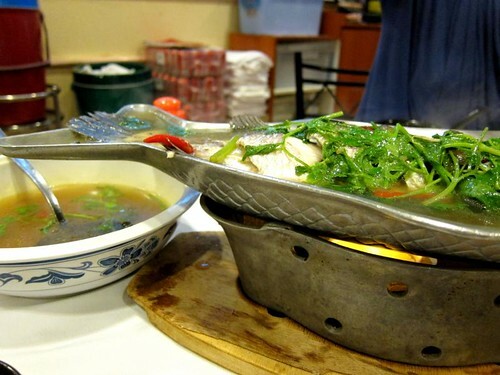 We carefully selected three dishes and one of the must-have for me is the Thai-styled steamed fish. To order your food, you need to seek the attention of the waiters wearing orange coloured uniform (the ones in blues helped to serve the food). As the place was packed, it took quite a while before someone came and took our order. 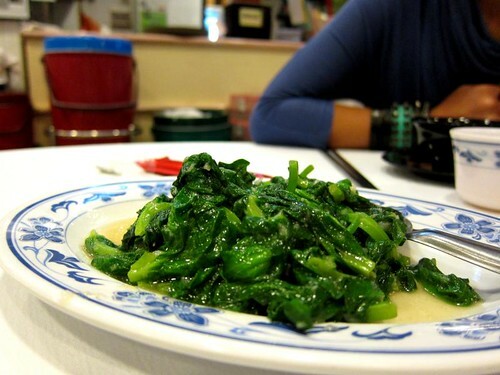 The first dish that we ordered was stir-fry pea shoots with garlic (蒜炒豆苗). Though it was slightly salty for me (on the hand, it was meant to be eaten with a bowl of rice), the pea shoot was tender yet without losing its texture. The garlic was not too pungent or overpowering. Upon another birthday girl’s request, we got a plate of seafood shang mee (海鲜生面). The shang mee was fried to crisp and soaked up all the beautiful gravy underneath – as you slurped the noodle, you still get that bit of crunch. After watching many plates flied past us, the star of the night finally arrived at our table – Thai-styled steamed fish (泰式蒸鱼). I took charge and ordered a sea bass (which was S$4/ 100g (freaking cheap)). 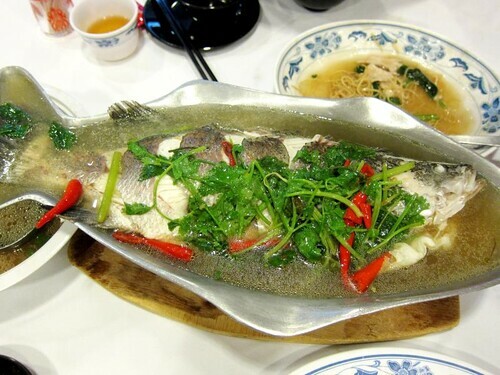 The fish itself was very fresh, the meat was tender and not overcooked. The Thai-styled tom-yam flavoured broth was equally delicious. We were busy eating and drinking the soup. At that point, I kind of regret not ordering a bowl of rice. I could imagine how well the rice and the soup would go together. But I was too stuffed. The beauty of Por Kee is it is very old-school. From the restaurant decor, to its waitresses, everything seems to be stuck in 1996 (which ain’t a bad thing). There is something very homely and comforting about the place. Yes the service maybe non-existence. The place and food feel like home – it is okay to eat and not say a word, and just indulge. One of my favourite things to do in Perth is to plant myself at Gino’s (located at Fremantle’s cappuccino stretch), enjoy a cuppa and watch people (and birds) pass by. Going on holiday does not mean fighting against time, rushing from one place to another. Sometimes, all you need to do is sit down and enjoy what is front of you. When I was in university, I was told one of the must-eats in Perth was fish and chips. 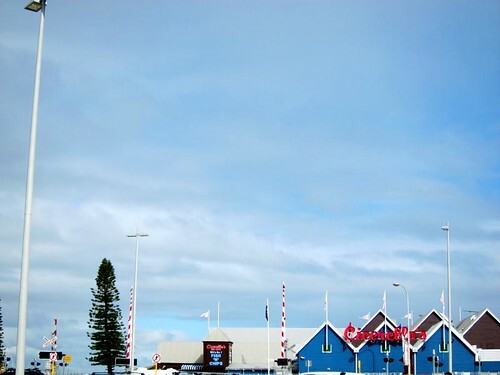 Perth (apparently) has the best fish and chips in Australia and the place to go was Cicerello’s. I don’t recall much about that meal – all I remembered was the portion was huge and I had to pay for ketchup (yes I am that cheapskate). So for old time sake, I decided to drop by the Fremantle Harbour and have a fish and chips lunch. One can choose to go to the touristy Cicerello’s which seems to remain a favourite among both the tourists and the locals. However I much prefer the quieter Kailis’ where they were just crowned “Best Fish and Chips” by SBS Feast magazine (2012). They were also famed for creating fish and chip gelato. I decided to be greedy and ordered the Seafood Delight which consisted of fish, scallop, calamari and chips. To help me wash the meal down, I opt for my favourite Aussie’s soda – Solo. I chose to alfresco dining which later turned out to be rather stressful. Eating outdoor at the harbour was almost like being in Alfred Hitchcock’s The Birds. Every bite you take was under the watchful eyes of the sea birds who were hoping that you might drop or thrown them a chip. Some of the nasty ones even purposely swooped down near diners and ready to attack. Despite the not too pleasant environment, it was a beautiful day. It was cool and breezy and the condition was perfect for chowing down a plate of hot fried food. Though everything on the plate was piping hot, somehow the batter went soft (the same go for the chips but I love soggy chips). Still the seafood was really fresh. I especially enjoyed the scallops which were plump and juicy. Dining at the harbour is not for everyone (especially for those who are squeamish about birds). With Singapore’s hot and humid weather, I rarely dine outdoor. I will savour every opportunity – birds or no birds. What do you do when you have two hours in Tokyo?